It's cold out pretty much everywhere, you're strapped for cash, and you need last minute gifts that don't include coffee mugs and bath salts. Here's a great no sew gift idea you can whip up in an evening, and for less than $1 each (psst. I won't tell your friends). You might even be able to make one for yourself! Item: Thrift store wool scarves like Grandpa used to wear are abundant. Pick one up that is in good, non pilled or fuzzed condition. Old tags are a bonus if you like a little extra embellishment that says - this was once grandpas scarf (i do!). 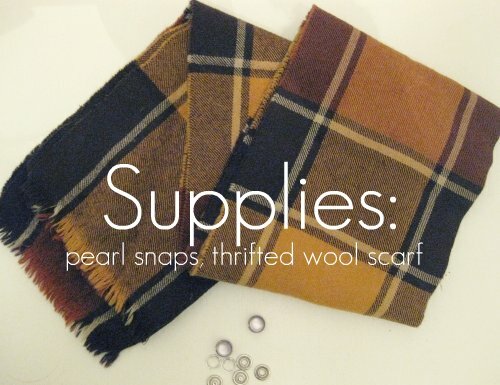 If you're allergic to wool, flannel scarves will work too. Item: Western Style, pearled no sew Snaps and snap tool from a fabric store. Wrap scarf around your head and ears to measure the length you'll need. The scarf I used here was exactly long enough when I cut it in half. You want to allow for approx 1" overlap for your snaps. If your scarf was like mine (most vintage men's wool ones are similar in size) open it up and cut down the fold line. This will give you 4 lengths of scarf to make 4 head warmers. Sweet! Set the other 3 aside for later. NOTE: Here I did a bit of trimming to the width of my scarf, based on how thick I wanted the band to be. You will have some loose threads here, but we'll finish that off later. Apply top snaps to the face of your scarf on fringed end. This will be the end which shows when your head warmer is snapped closed. 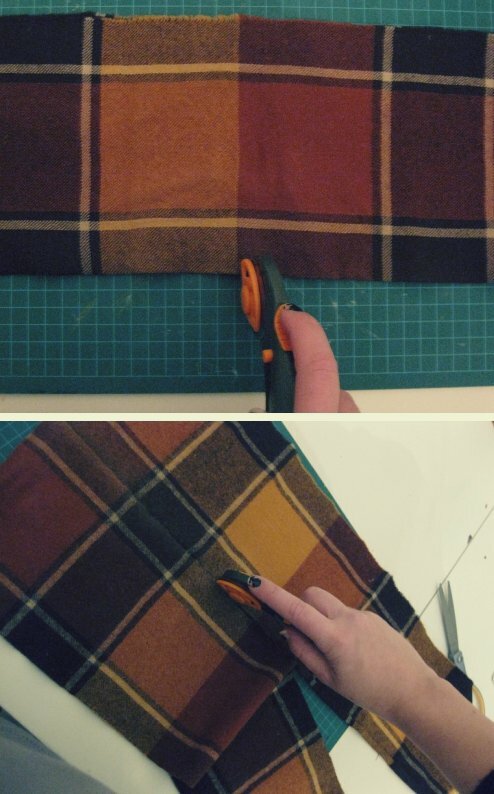 Use your tool and a mallet/hammer to affix the no sew snaps to the fabric. You will apply 2 snaps to each end so there will be no flipping or twisting when your headband is on. Nice and snugly. Apply back snaps on the other side of your scarf. Curl scarf over and line up your top snaps with the bottom ones. You're almost done already! Pull loose threads along the length of your scarf until there are no more loose one's sticking out along the edge. This will give your scarf a nice finished fray. Voila! Finished just in time to cuddle up with someone sweet and watch a holiday movie. 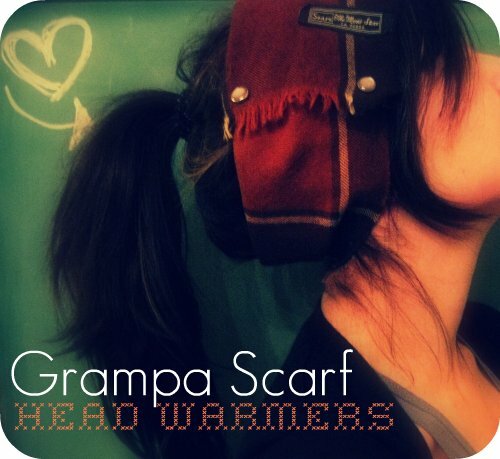 Your friends will love their Grandpa Scarf Head Warmers, and you'll want to make a ton more for your own wardrobe.